What is all the fuzz about?! 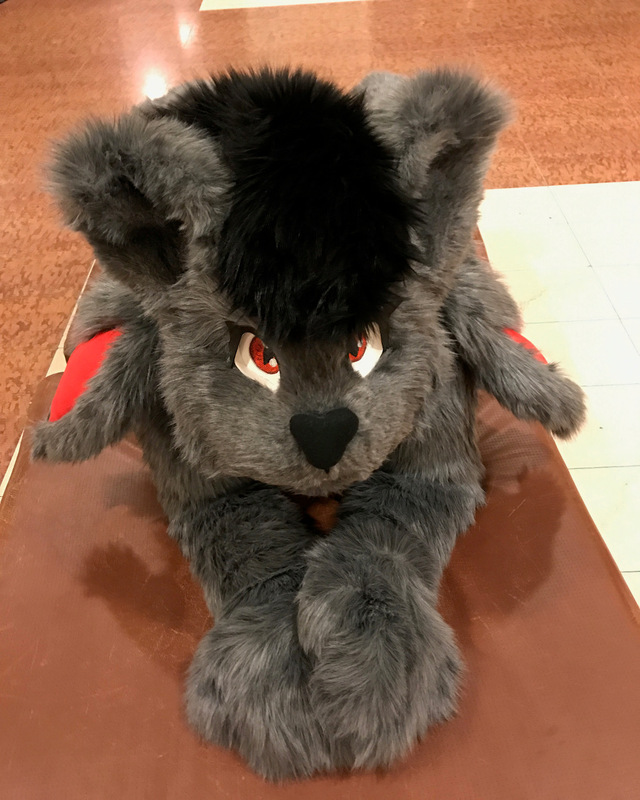 First, if you don't know what a Fursuit is, have a look at Wikifur. While I knew about furries and I have been kind of a passive furry for several years, I never got active in the furry fandom outside of Second Life. 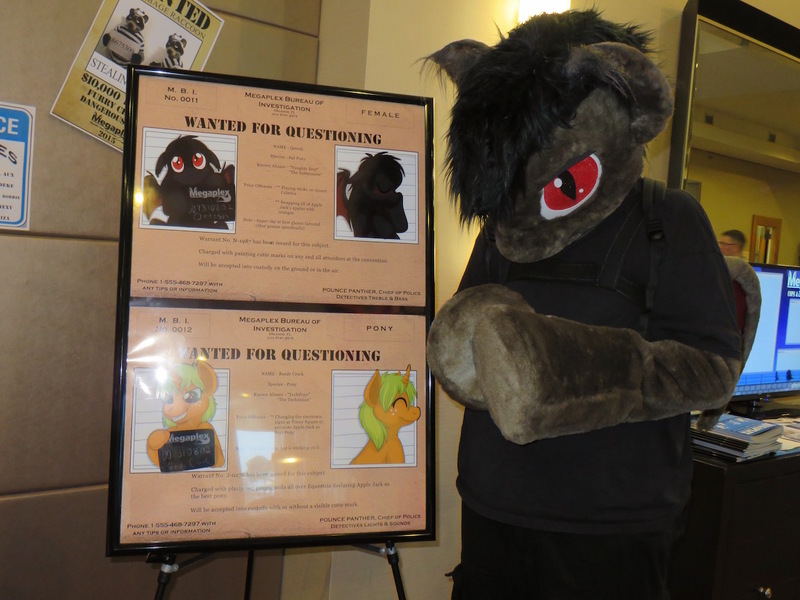 This changed when I visited BronyCon for the first time in 2013, which also was the first time ever that I saw fursuiters in person. I fell in love and wanted a suit for myself to be able to come closer to the character that I played online for a long time. 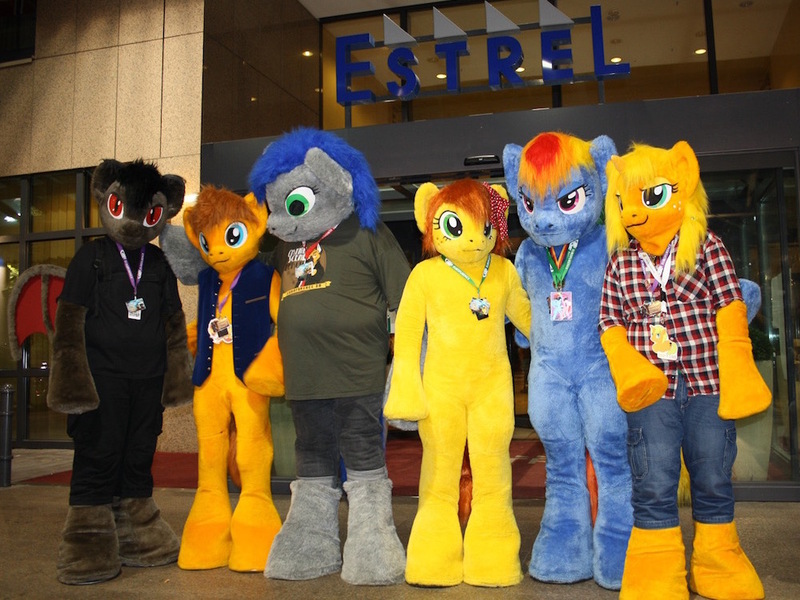 After looking into my options I found the suits made by Atalon who also built some of the suits I saw at BronyCon. After some debating and pondering I decided to order a partial suit from him some time later and planned to get it for BronyCon 2014. While Atalon was working on my suit I started to plan for it. As it was a partial, I needed fitting clothes. I also needed a way to attach the wings on my own as I wouldn't always have someone with me to help attaching them. After several weeks of planning, ordering stuff, tinkering, planning again and ordering more things I thought I had everything together to be ready for suiting. Never wear your suit at a convention without trying it before. I constantly got sweat into my eyes. Short term solution was to wear a headband. Later I got a balaclava which is a perfect solution. By now I have a complete undersuit of functional sports clothing which not only helps keeping me cool but also protects the fur. Regular suiting? Are you crazy?! Yes, I am probably a bit crazy. But not more than the other thousands of fursuiters in the world. 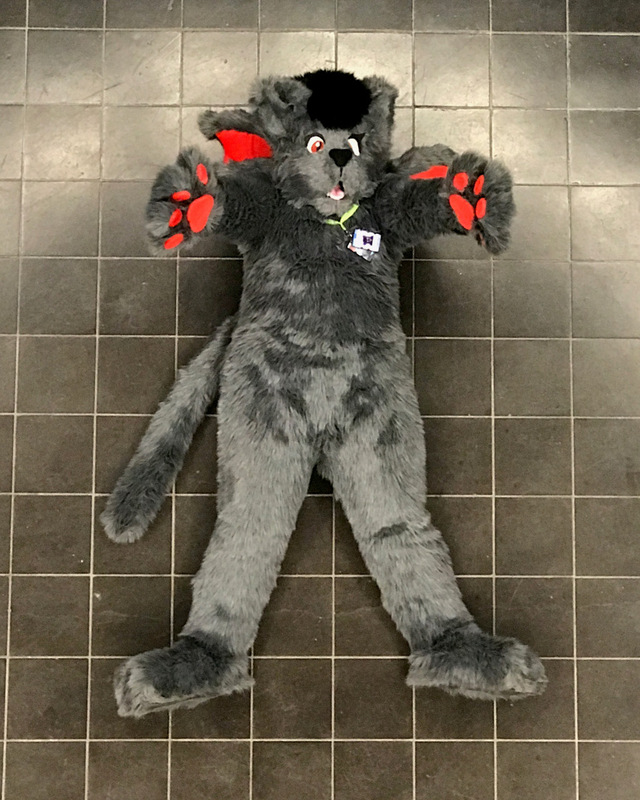 Performing in a fursuit is warm, you can't see much, you can't hear much, people don't understand you if you say something, you're sweating all the time and it is extremely exhausting especially at large conventions. But it is a lot of fun that makes it all worth it! Seeing the reactions of people to you, no matter if at themed conventions like BronyCon, at regular furry conventions or just random people on the street when participating in a suit walk. Everyone enjoys seeing you. You can bring a smile on peoples faces and of course it makes me happy when people by now recognize me just because they know my character! 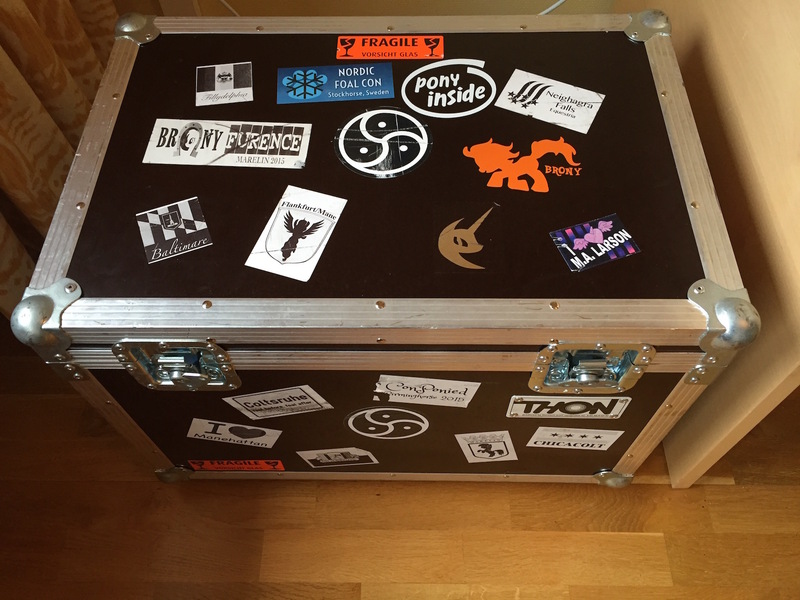 So yeah, I guess I am a little bit crazy to do that. But it is worth every moment. I love doing it and I made so many new friends since I started suiting and became active in the furry fandom. The only regret I have is, that I did not start doing it way earlier! After being a pony for quite a while I got together with Dratze who was just beginning to make fursuits. As my character originally was a bat-cat anyway, I dug that out again and Catesh was reborn. After getting a reference I was planning to get her as a suit and since Dratze wanted to try something new she offered to make her real! The suit was made with snuggling in mind. It's all soft without anything that might distract from what cats are for! I also decided to go with plantigrade legs to make it easier to wear and also keep some more dexterity.